Continuing our well received lecture program from last year, Old Monterey Foundation is pleased to announce our 2015 Marcia F. DeVoe lectures for July 23, August 7, and November 13, 2015. All lectures are at 6 – 7:30 p.m. in the Irvine Auditorium, McCone Building, 499 Pierce Street, Monterey. 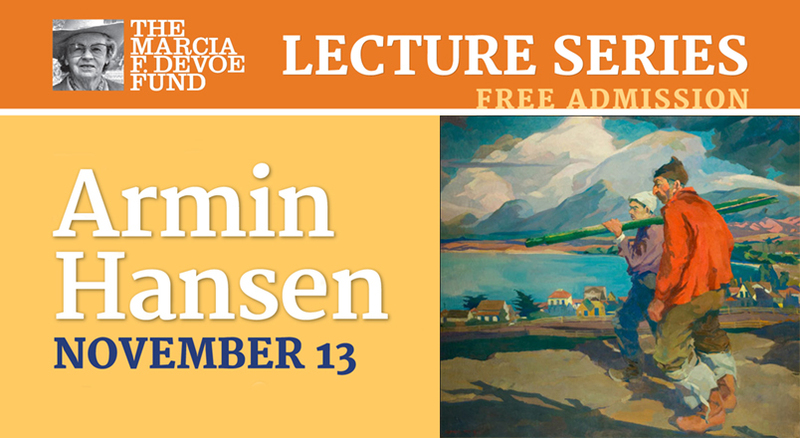 Admission is free but plan to come early as we were standing room only during our 2014 lecture series. Pedro de Lemos (1882-1954), our first lecture subject, was the last nationally recognized leader of the American Arts & Crafts Movement. For almost two decades he maintained a summer home on the Monterey Peninsula where he designed several whimsical buildings, taught various craft workshops with his wife, and found endless inspiration for his pastels, watercolors,etchings, and block prints. 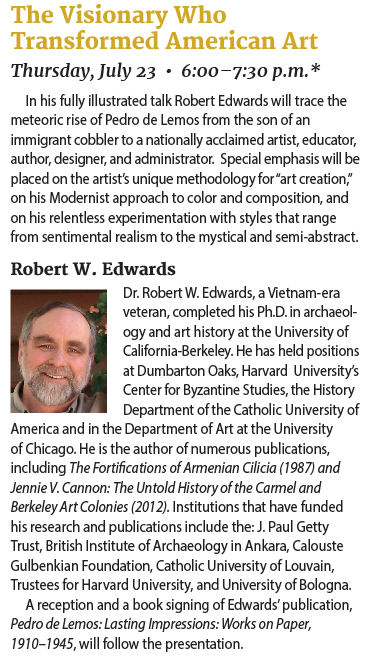 Our first Speaker will be Dr. Robert W. Edwards to trace the meteoric rise of Pedro de Lemos from son of an immigrant cobbler to national acclaim. Special emphasis will be given to his unique methodology “art creation” and on his Modernist approach to color and composition. 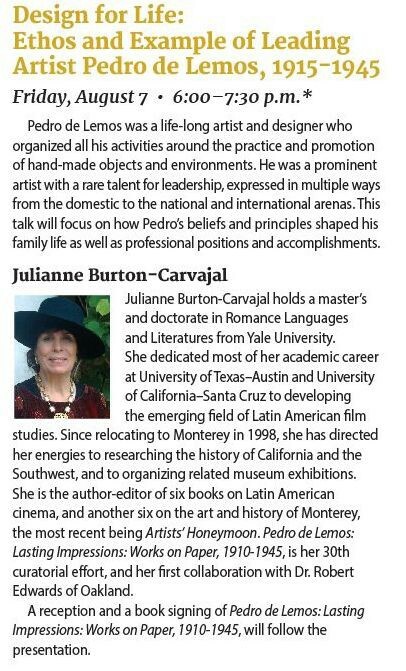 Our second lecture will provide additional details of the remarkable life and art of Pedro de Lemos. 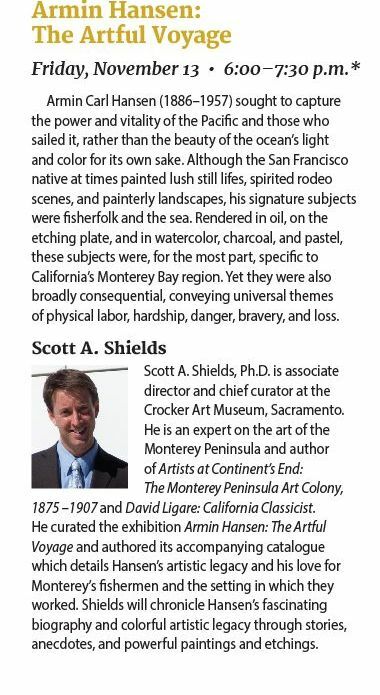 Our final lecture will be November 13, 2015, when Scott A. Shields will review the art of Armin Carl Hansen, whose seascapes were devoted to the Monterey Bay. Admission is free. All lectures are at 6 – 7:30 p.m. in the Irvine Auditorium, McCone Building, 499 Pierce Street, Monterey. Mark you calendar and plan to attend. Please also mark your calendars for two other exciting events that the Old Monterey Foundation will present in 2015.